There is a direct connection between the 'Sun vs Apache Harmony' dispute and the lack of a Java SE 7 platform JSR. Using newly available evidence I hope to shed new light on what that link is. Part of the reason these Apache projects are possible is that the JCP has been working over the last few years to clarify the role of open source projects and also to improve overall transparency. For example there were changes to the intellectual property rules in JCP 2.5 specifically designed to allow open source implementations. There have also been a number of transparency improvements in JCP 2.6 to allow earlier access to specification information. In addition to those JCP updates, Sun created a scholarship program under which we have provided Apache (and other not-for-profit groups) with free access and free support for Sun's Java compatibility test suites. The licensing rules for J2SE 5.0 were carefully designed to allow independent, compatible open-source implementations of the J2SE specification. Personally, I am not entirely sure if the world really needs a second J2SE implementation, but at the same time I am also glad to see that all the effort we put into getting the rules and the licensing issues straightened out is actually proving useful! Graham Hamilton's blog VP and Fellow at Sun responsible for Java at the time, written May 7, 2005. How times change. Update: The 'how times change' reference was a comparison of both of the above quotes to the dispute that followed, not a comparison of the two quotes. Sorry for the confusion. As is clear, Apache claim that Sun is in violation of the JSPA contract for both Java SE 5 and Java SE 6 platform specifications. The comments above also indicate how matters changed over the course of time. Given the dispute, it is clear that Apache would object to there being a Java SE 7 platform JSR without changes being made to resolve the issue. However, Apache is just one voice in the industry. The power in the JCP is held in two 16 member Executive Committes - one for Java SE/EE and one for Java ME. Clearly, therefore, Apache could be outvoted 15-1 on the SE/EE committee, and it has no vote on the ME committee. So, why hasn't Sun just submitted the Java SE 7 platform JSR and accepted/ignored Apache's No vote? Well, until recently, I thought that the reasons were all private information. However, it turns out that since September 2008, the Executive Committee meeting minutes have been openly published. As such, we can see how the Executive Committees have tried to resolve the issue. As far as I know, no journalist or blog has yet picked up on this. Given the controversial nature of this, I strongly encourage anyone following this to read the minutes themselves. Its a good insight into the the way in which the JCP operates (a style probably typical of any commercial based standards body). In this section I will extract some key elements, and make some minimal comment, but please read the full documents to make up your own mind. "The Executive Committee of the JCP supports the Apache Software Foundation's assertion that placing limitations on field of use for compatible implementations of Java specifications is contrary to the letter of the JSPA and the spirit of the JCP as a creator of open specifications." Note the 'straw poll' explicitly mentions the field of use restriction that Sun used against Harmony. This vote represents the collective wisdom of the two Executive Committees - Java ME and Java SE/EE - 32 votes in total, however there were 10 absentees. Note that there were two 'no' votes. Also note that Sun sits on both executive committees and thus has two votes. But there is no other information to tie those two facts together. Note how the proposal is explicit about the JCP becoming 'independent' and 'vendor-neutral'. Note also how the proposal accepts that the costs of such a body would have to be shared by its members. Again, the two Executive Committees - Java ME and Java SE/EE - clearly voted in favour of a resolution to further open the JCP. The sole exception was Sun, who abstained. * licenses do not contain Field of Use restrictions on spec implementations. So, the SE/EE Executive Committee clearly voted in favour (10-4) of a resolution in favour of an open Java SE 7 specification, and for Apache to receive the testing kit for Java SE 5 and 6. There is no information available as to the details of the discussion, nor or the reasons why individual participants voted for or against. Onno Kluyt gave a presentation in which he outlined a series of JCP reforms that Sun is willing to commit to. The presentation was followed by an extensive discussion. Roberto Chinnici summarized Sun's plans for the Java SE 7 JSR, expressing the hope that this would be submitted and approved soon. We can note that back in April 2008 Sun were making efforts to resolve the issues. Also note that Sun expressed the desire to submit the Java SE 7 JSR 'soon'. I'd also note that April 2008 is just before JavaOne 2008, which was in May - a time when Sun frequently makes big announcements. Geir Magnusson and Onno Kluyt reported that Sun and Apache have failed to reach agreement on the terms under which the JCK would be licensed to Apache for use in the Harmony project. They also reported that no further discussions are planned. Onno stated that Sun has no immediate plans to submit the JSR for Java SE 7. Rather, Sun plans to continue SE 7 development work through the OpenJDK project and through component JSRs that are already in progress. He expressed the hope that when the JSR is submitted at some point in the future the EC will approve it. EC members expressed their disappointment at this outcome, and discussed the possible implications without reaching any firm conclusions. Sun now have 'no immediate plans' to submit the Java SE 7 platform JSR. It is fair to ask what happened between April and June to cause the submission of the JSR to go from 'soon' to 'no immediate plans'. Sadly, there is no published information to answer that question, so I'll leave that open to debate (I can't comment further). Further, it can be seen that Sun are beginning to focus on working towards version 7 using Open JDK instead. Several members expressed concern that they weren't consulted about Sun's nominations. Patrick said that Sun was unwilling to make concessions on "control points" (such as the right to nominate for EC elections) without something in return. When members asked what concessions Sun wanted, Patrick responded that Sun expressed the desire to feel confident that the Java SE7 JSR would be considered by EC members without allowing the dispute about TCK licensing between Apache and Sun to obstruct it. This passage shows Sun as being concerned about whether the Java SE 7 JSR would be considered without the TCK dispute being resolved. Further, they link certain aspects of Sun control in the JCP (ie. who gets a guaranteed seat on the JCP) to the Java SE 7 debate. I'm not going to speculate on the details of what is clearly a politically-charged passage. The ECs then went into private session for a discussion on the negotiations between Apache and Sun. After these discussions it was agreed that Apache and Sun would explore the possibility of arbitration to resolve their differences. Arbitration is mentioned as one possible solution. Compatibility is a contractual obligation. - You must not ship incompatible products. - You can't be "almost compatible" or "a little bit incompatible". - The JCK contains 120,000 test cases. -- If you pass 119,999 you are not compatible. -- If you pass 120,000 and don't meet all the other requirements you are not compatible. This hammers home the point that any implementation of any JSR must be fully compatible. And that it is a contractual obligation. It also shows the size of the Java SE platform JSR testing kit. Again, discussions to resolve the issue by the Executive Committee are still ongoing in January 2009. There are no further minutes publicly available - January 2009 is the last published date. However, the next meeting is on April 9th 2009, so we should expect to see the minutes from February 25th approved at the April meeting very soon. Firstly, that this isn't just Apache vs Sun. Other members of the Executive Committee have been willing to side with Apache and vote against Sun (February and December 2007). Bear in mind that those members have access to even more information than is public here in order to judge which way to vote. Remember though that those votes are not-binding. Due to the structure of the JCP, the other Executive Committee members cannot actually intercede on behalf of Apache. Secondly, from the September 2008 meeting, there is distinct evidence (but not proof) that Sun feels unable to get a Java SE 7 JSR passed until the Harmony dispute is resolved. We can also note the difference in tone between April 2008 and June 2008, where a Java SE 7 platform JSR went from 'soon' to 'no immediate plans', and Sun's focus became clearer around using Open JDK instead of a JSR. Finally, it is clear that discussions have continued in one form or another for the entire time of the dispute. It isn't the case that the Apache open letter was published and then forgotten or ignored. Despite all the efforts, there has been no solution. And as such there is still no Java SE 7 platform specification. Thus, I hope its a little clearer why I'm arguing that, in all likelihood, we will get a JDK 7 implementation, but not a Java SE 7 platform open specification. Personally, I'm glad these meeting minutes are now public. Everyone can now see the behind-the-scenes discussion for themselves and make up their own minds as to the true state of the debate. In addition, you can freely judge if my blogging has been factual or not. Apache Harmony: Thanks for the TreeMap Work! I'd like to thank Apache Harmony for their JDK library performance efforts. We were given a tip that the Harmony folks were doing some interesting work with the TreeMap collection class, and low and behold they were. Controlled measurements showed the "fat" TreeMap significantly faster with in order traversals, and improved our SPECjbb2005 score by a solid 3-5% depending on the platform. Considering the potential performance gain we started the effort of porting the Apache Harmony TreeMap code to JDK 6. So, Sun's JDK runs faster today as a direct result of code written in Apache Harmony. If you use Sun's JDK 6 update 6 or later, Apache Harmony has already benefited you. And that just one of the benefits of open specifications and competing implementations. This blog explains the JCP IP process in pictures. And how Sun have managed to use it to block Apache Harmony. Within the expert group, a number of experts make contributions. Each member agrees, as part of the JSPA agreement, to grant their IP to the spec Lead. The spec lead will also add IP in the same way. 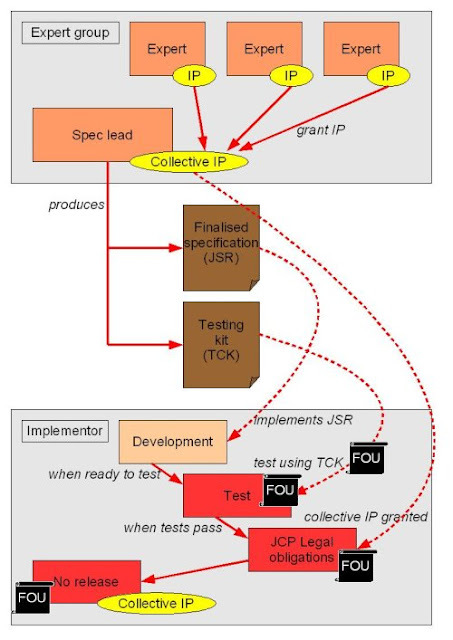 This produces a 'pot' of collective IP owned by the spec lead on behalf of the expert group. The expert group produces two outputs in addition to the IP - the specification itself and the testing kit. An implementor of the specification uses the specification document (which may well include Javadocs) to develop the implementation. The implementor will probably have their own unit tests at this stage. When the implementor feels that the development is nearly complete, they request the testing kit (TCK) from the spec lead. They then use that to test the implementation (and fix any bugs). Once the testing kit has been passed, there is another stage that isn't found in a typical project. 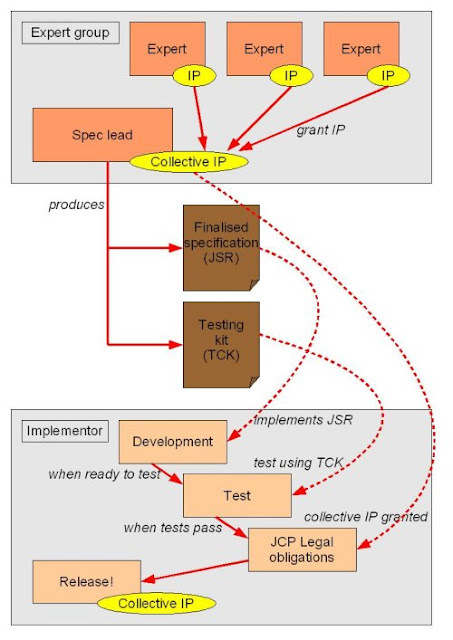 This is the stage of 'obtaining the collective IP' from the spec lead. This should be automatic if the testing kit is passed and the implementation is complete and valid. Finally, the implementation can be released. It can now claim to be a compatible implementation of the JSR. And the collective IP has been granted to avoid any unpleasant surprises down the road for users. Well, its important to realise that Sun didn't expect that Harmony would succeed. They thought that the task was too big. As such, they assumed that they would never need to worry about providing a Java SE testing kit, even though they'd agreed to do so. What Sun did was add a 'Field of Use' clause (FOU) to the license for the testing kit. This clause infected the tested code, and thereby infected the release. The precise details of the FOU are confidential at the behest of Sun, however in summary they state (rather absurdly) that the tested code cannot be run on a PC in an enclosed environment. Thus, you could run a tested version of Harmony on your PC providing it is running on your desktop. But if you pick the machine up and place it in an enclosed cabinet, such as inside an X-Ray machine, or an shopping mall information kiosk, then you would be breaking the FOU clause. Sounds absurd? Well it is yes. But remember, Sun didn't need something sensible. They just needed something, anything, to stop Harmony. By adding this clause, it meant that the tested code would need to contain an additional clause over and above the standard Apache license. A clause that would be invalid for any open source software as defined by the OSI. To be clear, this FOU clause would be an issue for any open source group trying to implement the Java SE specification. Since Apache only releases open source licensed code, Sun could therefore effectively block the release of Harmony. And in the meantime, it could spend all its efforts fooling everyone that Java is an open standard using the Open JDK initiative - an open implementation, not an open standard. Sometimes a picture tells the story clearer than text. Hopefully, these pictures will help illuminate you. If not, you can always read the legal agreement. Quick note to say I'm speaking on the Fan Fantom programming language tonight in London. The evening will also include a brief intro to OSGi. Its at the JavaWUG user group, hosted by Skills Matter, registration required to attend.